Newcrest Mining's Cadia Valley Operations has developed this website to provide a record of the mining and farming history of the Cadia Valley, as discovered through historical research and archaeological surveys commissioned by Newcrest Mining. The rich history of the Cadia Valley would not have been recorded without the assistance of many current and former Cadia District residents, relatives of descendants who lived in the area and the historians and archaeologists, in particular Dr Edward Higginbotham, commissioned by Newcrest Mining to undertake surveys and research of the Cadia Valley. The information and historical photos provided by local people and the archaeological research and reports have been utilised in the development of this website. The history of the Cadia Valley begins with the Wiradjuri people, the traditional owners of the land. 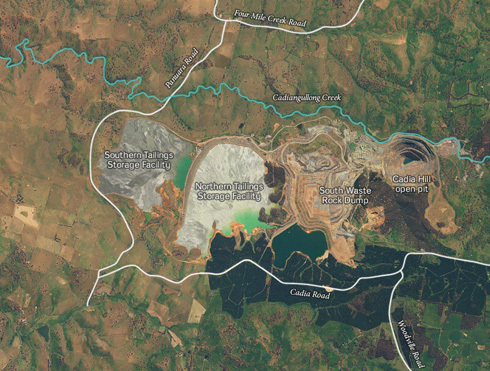 The Cadia mining history began in 1851 when traces of copper were discovered near Cadiangullong Creek. It was 10 years before the Scottish Australian Mining Company commenced major mine workings, erecting an engine house and smelting works. Cadia Village was soon established and survived through several stages of mining activity for copper, gold and finally iron ore, before being deserted in the 1940s. In its most prosperous times, Cadia Village supported a population of 600, as well as a general store, bakery, post office, butcher, shoemaker, school and a cemetery. Periodic downturns in mining, from as early as 1868, were triggers for many to take up land in the area, realising a dream for many miners. Newcrest Mining discovered the Cadia Hill orebody in 1992, which was large enough to secure Newcrest's future in the valley with the final estimate of gold potential for Cadia Hill projecting a 12 year mine life. Cadia Valley Operations currently comprises two underground mines, Cadia East and Ridgeway. These are large scale mining operations using caving mining methods. Production from the Cadia Hill Open Pit was suspended in July 2012 and further development will be assessed in the future.